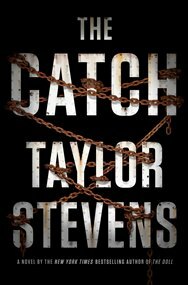 I first read about author Taylor Stevens in an interview in Vogue magazine. I was thoroughly intrigued and anxiously awaited the publication of her first book, The Informationist. I was not disappointed. Stevens’ protagonist, Vanessa Michael Munroe, is a true modern day hero. Despite her own difficult background, she stays true to her own moral code and, for the most part, concentrates her skills on helping the helpless. So-to date I have purchased and read all of the published novels by Taylor Stevens. I was thrilled when LibraryThingEarly Reviewers chose me to receive a copy of The Catch. Taking a break from her past, Munroe is living and working in Djibouti. Here, she is “Michael”, a young man working as a fixer for a company which provides armed security for cargo ships. Her true skills remain hidden from her employer and the other workers. The freighter Favorita is highjacked by Somali pirates on its way from Djibouti to Mombasa. Munroe is able to escape with the ship’s captain, who has been injured in the fight to take the ship. Although there are illegal arms hidden on the ship, Michael soon relaizes that the captain was the true target of the raid. Making her way to Kenya with the captain, Michael must discover who is responsible for the hijacking. And then she must devise a way to re-capture the ship and its crew. Among Michael’s many gifts are her intelligence, her fluency in many languages, her chameleon-like ability to blend in with her environment and, last but not least, her skill with knives. She uses all of these in her efforts. The Catch is a fun addition to the series. It is not my favorite of the four books, but I definitely recommend it highly.